The local traditional Turkish steam bath is open every day, all year round. 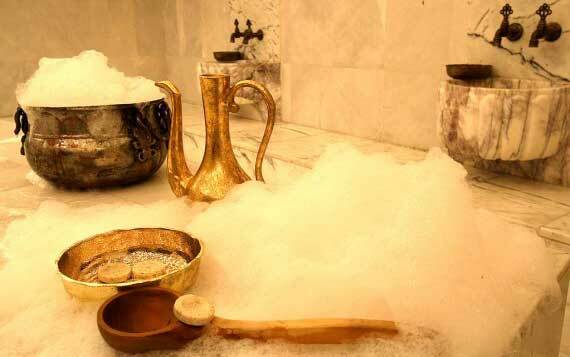 The hamam experience is a highlight of Turkish life and travelers, turning bathing into a social, relaxing event. The Selcuk Hamam is only 15 minutes walk from the Hotel. A ladies only session is held every Friday afternoon and is very popular with tourists and local women alike. Steaming – sitting or lying around on the big central marble “Belly Stone” (göbek taşı), releasing and talking. Scrubbing – the attendant will direct you to lie on particular place on the belly stone and using a hand-mitt to scrub you down head to toe, its not painful unless you are sun burnt. Soapy massage – after the scrub-down and some more steaming, the attendant will again direct you to lie down and then soap you in bubbles head to toe with a light short massage, tip if you want longer! Cool-down – after washing down and if you want washing your hair, you go back to your original dressing room where it is customary to lie around in the fluffy towels to cool down and dry off before dressing and going back to the world outside.